You KNOW I love you because this is the giveaway you've all been waiting for! there could not be three more powerful words. it seemed the perfect combination for a special necklace to honor those that are fighting cancer. Cancer is so limited . Truly inspirational, I know. Please check the r house couture ... you'll be smitten with their wide array of hand-made, inspiring, absolutely beautiful jewelry. THIS IS OPEN TO EVERYONE .. NO MATTER WHERE YOU LIVE! Winner will be drawn and announced on Saturday, August 14th. Good luck to all! I love the 2 name necklace - everything is gorgeous! I love the "i can do hard things" necklace! I'm in love with both the "Come What May and Love It" and "I Can Do Hard Things" necklaces. Those are two of the phrases I repeat to myself often, as well as the conference talks I read/watch on a regular basis. They're all great though! are you back yet? Like to see pictures of all paper cranes. How many did you get? Did you reach the 1000? And btw congrats on the 200! Amazing! Just brilliant. And such a great giveaway to celebrate it. Wonderfull pieces they have (I love the mini soar one or would give the I <3 you to my beloved hon'). Hope everyone around you is fine. I like the courage one and forever in my heart is a cuteeeeee! I like the "faith" necklace because - 1.) We are finalizing the adoption of our first child and 2.) I'm pregnant even though the doctors said it was not possible without medical intervention!! Oh, I really love the smokey quartz earrings! I won't enter because I make this sort of jewelry myself and it wouldn't be right to win over someone else but I wanted to say Congrat's on your 200th follower!!! I'm same as above poster - won't enter since I make this kind of jewelry & it won't be right to win over someone else :) But CONGRATS!! Such a lovely quote too. WooHoo! Congrats on 200 followers!! I like the FOREVER IN YOUR HEART necklace. Well I like lots of the necklaces. I love the I can do hard things and the initial necklaces. Wow...that is such a beautiful giveaway,sweetie!!!! Congrats on 200!!! Sooooo lovely...I adore your post today...inspiration my friend. I love her monogram bracelets..but really everything is amazing. Congratulations on 200!!!! Hugs. P.S. Just wanted to say thank you so much for dropping by my blog & asking about the jewelry! I've mainly made it for friends as gifts, but I'll definitely consider something for your beautiful blog! :) This is just such an inspiring space. I went to the couture website and I was really impressed with the "openness" of adoption on her products. Being an adopted child, it is heartwarming to see more of an acceptance and genuine outpouring of love. . . . I put a link on my blog for you....and their is also a link in my heart for you..........hahahhhaha!! I love the Enjoy the Journey necklace. I think it's something my friend Jake would've thought was awesome. Denalee!! This is such a heartfelt and truly lovely silver strands worthy give away. I have so many people dear to me that have lost the battle to cancer, some have beat cancer, others have lost close friends and family to cancer, you and your family are such an inspiration. Cancer is not all mighty and powerful it is not at the top of the food chain so to speak. It can cause pain but it can never truly take away what is dear to us for those are the things that are locked safely in our hearts and souls. I love the crown stamped square earrings they are beautiful. I love all things in the shop,lol.But my favorite is the Hope strength and courage bracelet. Congrats on your 200 followers Denalee. I love the "Perfect Brightness of Hope" and "I can do hard things" pendants! I also really appreciate all the very cool adoption things. Four of my six children are adopted. I will be ordering from this etsy shop! You have such a kind heart Denalee!. HUGS! Love it! Very cute! Count me in! I DO LOVE THE COME WHAT MAY NECKLACE. ALL OF HER WORK IS BEAUTIFUL. SHE OBVIOUSLY HAS A REAL PASSION (AND A GOAL) EVIDENT IN HER GORGEOUS PIECES. I have blonde hair and let it grow very long and then have it cut so that the hair can be donated to Locks of Love. I visited the Etsy Store and made it a favorite. I liked the "I can do hard things" charm. We all need to remember that. Discovered your blog this morning while I was blog surfing and looking at which blogs people have in their favorites lists. Cheers. I would have to say that my favorite is the "COME WHAT MAY and LOVE IT Necklace with Pearl and Peridot" - it's so beautiful and a great reminder to wear daily! Thanks for such a fantastic giveaway! You are an inspiration to us all. my favorite piece from the R house would be the Two Name Custom Necklace with Mini Heart Charm. it's really cute! 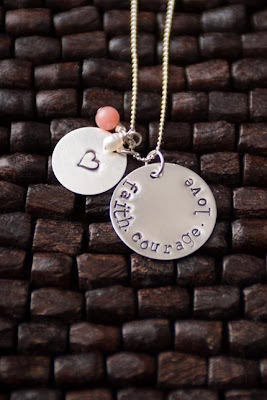 I love the birthmom necklace! I like the tiny inital charms! And, because I have 2 sons...I like the 2 name rectangle necklace! I adore the mother necklace! We all have our stories...our trials...our tears...but that one word (aka mama, mommy, mom) can heal a broken heart, or at least mine. The "be strong" is cute, especially since I get to work with our cute YW & that's the theme this year! I hold your hearts in mine!!! Love it! I love, love, love the FOUNDATIONS Necklace. Posted about your fabulous giveaway on the sidebar of my blog with a link back to your blog. I love everything in the shop, but one I really want right now is the "keep calm and carry on" necklace. I can always use that reminder! this is beautiful! The one for the giveaway, thats my favourite from r house couture.